Where Can You Hunt In Chicago? 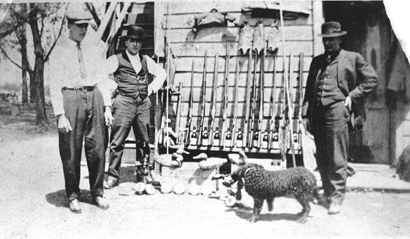 Hunting has been a tradition for generations of Chicagoans. Duck hunting at Wolf Lake has been a tradition for decades. An duck on Wolf Lake being shot, for now, by a photographer. Chris Rollins manages Wolf Lake for the Illinois Department of Natural Resources. He said the waterfowl hunting in this area is among the best in the state. 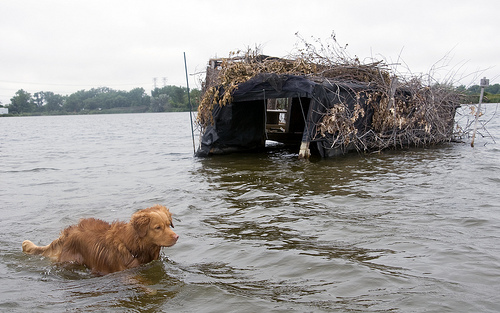 Buddy the dog and a duck blind on Wolf Lake near the Illinois and Indiana state border. Curious citizen Andrew Eubank’s hunting experience consists of exactly one unsuccessful Wisconsin expedition in pursuit of squirrel. It’s a different story for the Lincoln Square resident’s downstate relatives. His grandfather graduated third in his class from the University of Illinois, but decided to raise hogs back home in Willow Hill, Ill. — a village of 300 people. Andrew’s father, Arthur Eubank, has fond memories of shooting squirrel, rabbits and quail downstate. They still visit their Jasper County relatives for holidays. What are local policies on urban hunting? It’s generally assumed that hunting in your backyard is something you need to give up when you move to the city. As distant as city life may at times seem from the rural lifestyle, food is one thing that unites the two — a trend explored at great depth in the recent wave of books in which previously unlikely sportsmen rediscover hunting. Still, as Andrew points out, there is a cultural gap. But you don’t have to travel to Jasper County to find out. So where can Chicagoans hunt? Well, you can’t hunt in any of the Cook County Forest Preserves. And Chicago’s gun laws seem to constitute a de facto ban on hunting in the city. But we wanted to know what was actually on the books. “Any person licensed to hunt under the provisions of The Illinois Wildlife Code, as amended, may hunt or kill game birds in the open season as provided by the laws of the state, within the following prescribed districts and portions of the city: upon Wolf Lake and along the shores thereof; upon Lake Calumet and along the shores thereof; and upon the Calumet River and along the banks thereof. Provided, however, that no weapons shall be used for the purpose of hunting such birds, or killing or wounding, or attempting to kill or wound such birds, other than a shotgun, and that such shotgun shall not be discharged anywhere within 750 feet of (1) any building or structure used or intended for human habitation or employment, or to be used as a barn or stable; or (2) the centerline of the right-of-way of Stony Island Avenue. So, there are only two public hunting areas within city limits: William W. Powers State Recreation Area on the Illinois-Indiana border, and Lake Calumet just to the west. You have to get a state permit, obey state hunting season and limits, and you can’t hunt there with anything except a shotgun. Andrew could also take a boat onto Lake Michigan, where Chicago’s jurisdiction only goes out one mile. Better known as Wolf Lake, the state acquired the William W. Powers site in 1947. About half of its 800 acres lie in Illinois, where the state’s Department of Natural Resources presides. (You can’t hunt on the Indiana side.) In total you’ve got 419 acres on which to shoot waterfowl. As on most public lands, hunting on and around Wolf Lake is heavily regulated. (Check IDNR&apos;s annual hunting digest for comprehensive information.) There are 26 duck blinds — huts built onshore or out in the lake, which is quite shallow throughout, and camouflaged with reeds and sticks. Hunters set up shop early in the morning during duck season, using duck calls and decoys to lull their game into a false sense of security, and fire from the blind. Each blind has a direction — the local Illinois Department of Natural Resources officials regulate this to make sure hunters aren’t firing toward one another. 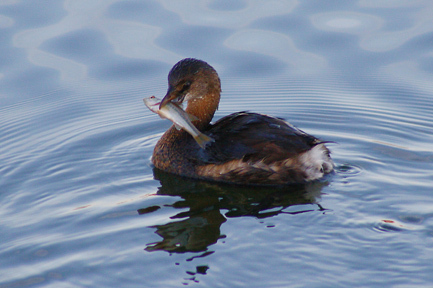 Access to the park is restricted each day during duck hunting season until 1:00 p.m., when hunting ends. The blinds are reassigned each year by public drawing. Anyone 16 years or older with a valid hunting license can apply, but there’s more demand than supply — this year there were about 100 entrants. If a blind is unoccupied and you’ve got your state permit in order, it’s fair game to use a blind even if you didn’t win the public drawing. But those hunters who did get priority. Once a Cold War-era Nike missile base, William Powers is now part of a pastiche of natural areas and industrial sites that stretches from Chicago’s far South Side into northwest Indiana. So our question asker Andrew Eubank doesn’t need to traverse the state to plumb the depths of that “cultural dissonance” he associates with hunting. One Chicago-area hunter, Kraig Kaatz, told me he comes to Wolf Lake in part to escape the hustle of Chicago and its sprawling suburbs. We went out on the lake one morning in his 12-foot metal boat, joined by his wife Arlene and four-year-old retriever Buddy. It wasn’t hunting season yet (that starts Oct. 19), so Kaatz tested his duck calls and decoys while Buddy splashed around. On our way back to shore, Kaatz said he thought Wolf Lake could stand to have more hunters. The number of hunters in the U.S. is actually up after years of decline, according to the U.S. Fish & Wildlife and Wildlife Service&apos;s latest report. If the trend continues, urban hunters may have to go farther afield than the southeast side. Rollins said the number of duck blinds at Wolf Lake isn’t likely to change soon. So there isn’t much hunting in Cook County. But Chicago isn’t very far from several public hunting areas in the region. To name a few: Chain O’ Lakes in Spring Grove; Mazonia/Braidwood in Grundy County; and Will County’s Des Plaines Conservation Area, which offers the largest pheasant hunting (by permit only) facility in the state. Northeast Illinois hunters made more than 35,000 trips on public lands during the 2010-2011 season, according to IDNR records, bagging more than 27,000 animals. The bulk of that (71 percent) was pheasants. 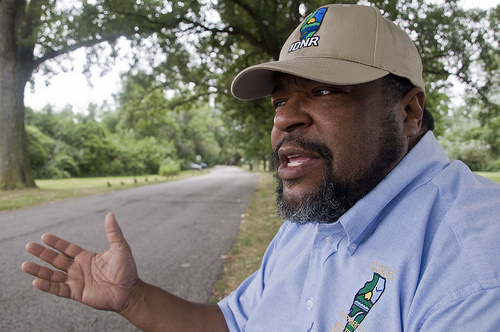 Until December Wolf Lake’s steward Chris Rollins was the regional land manager for IDNR, meaning he watched over state sites in Cook, DuPage, Grundy, Kane, Kankakee, Kendall, Lake, McHenry, and Will Counties. Andrew also wondered about trapping, and for Chicagoans the situation is similar to hunting — in the city your options are limited, but you don’t need to go too far. In Northeast Illinois there are three IDNR areas that allow trapping: Des Plaines Game Propagation Center, I & M Canal State Trail, and Kankakee River State Park. Trapping requires a state permit separate from hunting. The state issues limited licenses for “nuisance animals,” say a bat caught in your attic, and there are plenty of private animal control firms that will do that work for you, too — the state maintains a list of licensed operators by county. Chicago’s Department of Animal Control can trap animals, but they won’t set a trap for rabbits pillaging your backyard garden; only if it’s a direct threat to public health or safety — like coyotes behaving aggressively. Chris Bentley reports for Curious City. Follow him at @cementley.